I woke up yesterday in desperate need of a me party. A party by myself. 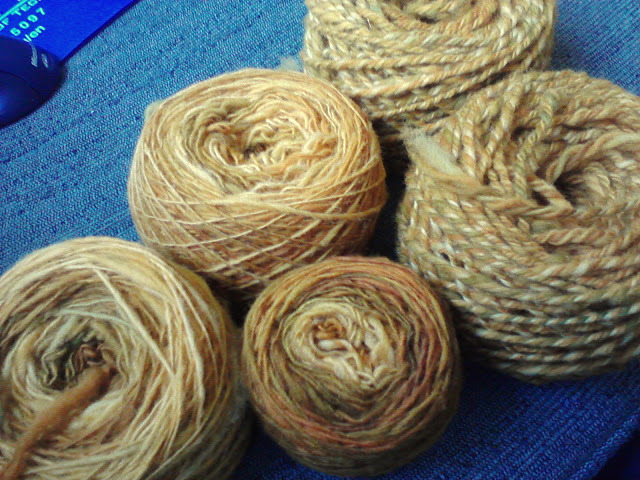 With no guests but me, my wheel, and a pound and a half of singles waiting to become a super-bulky 3-ply. If I could spin balanced singles, this yarn evidently would be an adorably self-striping light worsted. I can’t, and I like three-ply, so off we went. It took an hour-long Doctor Who confidential and two and a half episodes of Buffy to ply it all up into a fluffy sunflower parfait. As an aside, I had a stroke of brilliance concerning my niddy-noddy. I got points off for my handspun entries at the Maryland Sheep and Wool festival for having skeins that were too short; the entry form did clearly state that skeins had to be 2 yards in circumference. I had made skeins, and I wasn’t about to re-wind them, so I decided to let it go and take the hit. But I thought I’d have to buy a new niddy-noddy for next year. The thing is only about a foot long, so I can only make 4-foot loops going around the whole thing. Then bam! Like Franklin with a kite, I realized all at once that I could make six-foot skeins – I just have to go back and forth around the niddy noddy. So, starting at one of the notched ends, I go around the two non-notched ends, around the other notched end, and then back the other way. I just had to be careful that I went in the same direction around the notched ends, and then when I tied it and pulled it off, the middle separated itself perfectly into a six-foot long loop. P.S. if anyone who spins would like to join us at some point, you are welcome! Mom will be here from next Thursday through Saturday, and we’ll be at the new house spinning, chatting, and probably watching movies the whole time. email me for directions.